So one time I was making a salami sandwich at home, and I put the thing right on the counter, no plate, just like this picture here. I left the kitchen for all of 45 seconds and when I returned, the sandwich was gone. But my dog was there. He turned away from me. When I cornered him, I saw small half circles of salami jutting out from around his mouth. He had the whole sandwich in his mouth, hadn't even chomped it at all. It was just resting in there. He was smuggling it. 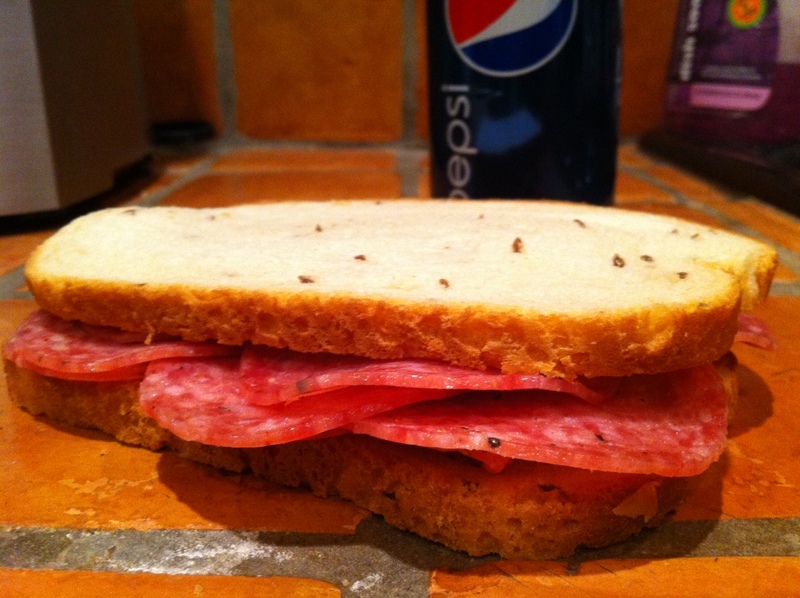 This is regular old plastic-package, store-bought salami, piled three layers deep on dill rye bread. That's it. Nothing else. I've been eating this since I was a kid. That will probably continue forever, dog smugglers notwithstanding.